Has Your Tachometer Stopped Working? A tachometer, also recognized as an RPM gauge or a revolution counter, measures the speed in which an engine’s crankshaft rotates. Some indicators let one know when it is operating at a safe speed and when it is not. This helps the driver decided whether they need to switch gears at any time to accommodate driving conditions. If the tachometer stopped working it might not appear to be a huge deal, but that is not the case at all. Those who drive a manual vehicle know that the sounds made by the engine are how you determine when to switch gears. If there are things that are not working as they should, it can cause a host of problems, which is why you need to ensure that this is fixed right away. A mechanical tachometer works similar to the way in which a speedometer operates. A rotating shaft that is attached to a flexible cable connects the moving part of the engine to the gauge. In turn, the shaft controls the needle and indicates the speed of the engine. At the center of the device is a magnet that moves when the shaft does. The spinning magnet that is located inside the sensor creates a force on the needle and spring counteracts in. 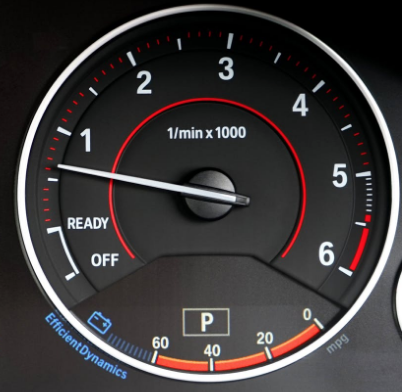 This type of tachometer was always found in older vehicles, but in recent years many manufacturers have decided to use a device that is electronic with a digital readout. Keep in mind that these are often considered superior, but that is not necessarily the case. Each type has their list of pros and cons. If this device is not working correctly, it can be tempting to toy around with it to see if you can fix the issue on your own. This is never a good idea since making one small, incorrect move can make the problem worse instead of better. Wiring and installing a tachometer may seem like a reasonably simple task. You can discover tutorials all over the place that claim to have all of the information needed to do things on your own. But, you must consider the fact that if you fail to install things correctly, it can cause significant problems to the ignition and tach systems. The main issue is that while these devices all work the same in theory, OEM and aftermarket parts can have different ignition systems. On one vehicle it can be as simple as rerouting a single wire, but others have a dedicated circuit for tachometers. If you are not 100% certain of which is present in your vehicle, it would be best to err on the side of caution and leave it to the professionals. There is a chance that your problem is a blown fuse. This is something that a seasoned professional can take care of with ease. It can be tricky for someone who is not well-versed when it comes to this type of device. If you are unable to read the display, which means that you cannot properly gauge when there are engine issues, this needs to be taken care of right away. You can take it to a repair shop and have it taken care of in no time. Once you have had a vehicle for quite some time, the calibration of the tachometer can be a bit off. This does not mean the entire device needs to be replaced. You can take it to a ship and have them recalibrate it to the way that it was when you originally made the purchase. There may be something wrong with the wiring, or there is a chance that there is a weak connection someplace. In either case, you should have this looked at as soon as possible. You do not want to ignore this since it could be pretty severe and lead to much more significant issues. As you can probably tell, repairing a tachometer is not something that you can master by glancing at a few manuals and watching a short video or two on the Web. This is something that you need to trust a professional to handle for you. While you are more informed about what this is and how it works, that does not mean that you are prepared to repair this on your own. If you have an issue and you think this may be associated with your tachometer, contact our shop right away to get it repaired.